Will you be part of this outpouring of support for our fellow human beings in Africa who are being crushed by a handful of abusive, corrupt and power-hungry individuals who have little or no conscience or regard for their fellow humans? Almost every great social change throughout history has resulted because people of moral convictions and compassion towards others, have stepped out of their comfortable lives to advocate for others. Will you be one of them? As he drives around New York City area, literally thousands of people see the picture of Ethiopian dictator, Meles Zenawi, and Sudanese dictator, Omar al-Bashir, separated only by the skulls of human beings. In the last few weeks before the march, there is still much left to be done to get the word out and we need your help in doing it. One Ethiopian taxi cab driver has attached the March banner on top of his taxi. Can you, your family, your friends or some group to which you belong, contribute the cost of mounting these signs on fifty or more cabs? The cost is a mere $150 per cab, but the numbers of people who could be reached by this message could be many thousands! This is an excellent way to educate non-Ethiopians and non-Africans who care about justice, peace and freedom about the harsh realities in Africa. These are people who may not understand that many of the humanitarian problems with policies and actions of dictators. Ethiopian taxi drivers are in a strategic position to provide further information to their passengers who might inquire about this provocative banner, many of whom may be key decision makers. Meles and other dictators are blocking the media in Ethiopia/Africa, but by doing this here, we are taking it into our own hands! The newspaper, Internet and TV are all controlled by the governments of Ethiopia, Sudan and under other dictators in Africa. But now, what we are asking you to do is to advance the truth in our own way. The more funds we have, the more we can do! Would you be part of this? 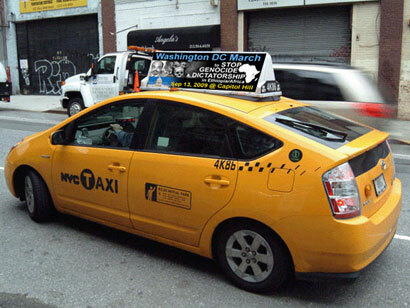 If you are a cab driver in Washington D.C, will you mount this sign on your cab so that as you drive, doing your work, you become the voice and the feet of Ethiopians and Africans who cannot raise their voices in protest and cannot march in a demonstration of dissent without grave risk? If you are willing, but need financial help, please contact us. If you are willing and able to cover the costs yourself, please let us know and we will help you get the sign for mounting—the sooner the better! If Ethiopians, Africans and other concerned people really want change, these actions are but small contributions to better the lives of others. Compare this to the sacrifices of many in Africa who may have died or who may have been beaten, tortured or imprisoned for speaking out for their God-given rights! Think of the 193 peaceful protestors who died as they spoke out against the flawed Ethiopian National Election of 2005, the thousands who have died in Darfur, in the Congo, in Kenya after the election, in Zimbabwe after the election, in Nigeria following their election and numerous other places. Consider all the political prisoners throughout the continent who are being held for simply demanding the kind of change that is enjoyed in free countries throughout the world. They have sacrificed much. It is now the privilege of those of us living in free countries to turn around and help our brothers and sisters of Africa to attain the same freedom. There is so much we can do if we want change to come to Africa. If you are someone who can contribute to the many and varied costs of promoting and holding the march, even in small amounts, please come forward. If you are part of an organization, a mosque or church, a wealthy individual, a business or restaurant owner, you can both help the march and promote or advertise your own business or group. We are interested in finding sponsors who, if they want, can publicly recognized. The success of this event is in all of our hands. Thanks to those Ethiopians who have already told us that they have bought their airline tickets to come from different states and countries to join with us. How about those who are close by in Washington DC or one of the neighboring states? Will you be there? Last week in Washington DC, Eritreans held an Eritrean festival where 10,000 Eritreans showed up and filled the convention center. Right now, I am told that there 300,000 Ethiopians and many other Africans living in the DC area. This is a great opportunity to bring your whole family and give a lesson to your children about conditions in Ethiopia and Africa and how important it is to speak up for those living under such oppression so our world becomes a better, more humane and safer place. If you are among those who are complaining that: “things are not good in Ethiopia or Africa,” “the politicians have disappointed us,” “the division killed the struggle,” “people cannot work together” or that “the TPLF is doing damage to destroy Ethiopia,” you are one of those who should be at this march, speaking out for unity and change, merely by showing your presence. It is time for more action and less talking! The suffering of others is what this March is about. In Ethiopia, there is no hope. All the factors that make life unbearable are everywhere present in the country, pushing people to take risks in leaving the country that often result in dangerous situations. Just last week, an Ethiopian woman was gang-raped in a Middle Eastern country where numerous other reports have surfaced involving forced servitude and sexual violence against Ethiopian women who left Ethiopia seeking jobs and better lives. Many others who remain in Ethiopia end up homeless on the streets or starving in the countryside despite possessing land that outsiders are seeking to feed their own people. Only dictators would make such bargains that would reap such havoc and misery on their own people while filling their own pockets with the blood money. This march is one step forward to stop such exploitation of the people. This march is to tell President Obama administration and the world that what is happening to Ethiopians and Africans is indefensible and must stop. It is largely because of serial dictators and their corruption that Ethiopia and many other African countries remain unable to feed themselves and dependent on the world. This must end! This march is one step towards moving from being a beggar nation(s) to a better nation(s), from being poor to prosperous, from being infected with “ethnic hatred” to establishing equality and the rule of law regardless of ethnicity or religion, from corruption to accountability, from deception to transparency and from genocide and dictatorship to freedom, justice, respect for human rights and democracy. If you are ashamed and hurt by what is going on in Ethiopia or Africa, your conscience should be your invitation. If you are heartbroken by what you see, your compassion should stir you to action—by participating, contributing or promoting this march as one step towards bringing international attention and pressure for change on any who are holding this country and continent back from reaching its God-given potential. Do not wait to be asked. Sustainable freedom and justice are not attained without a struggle. Will you do your part?